Alchemy Stones: What the different sizes "mean"
We have had a few people send in questions, specifically asking what the different sizes we use in descriptions-- petite, small, medium, large, etc-- actually mean. Is there a general rule we use? Is size "relative?" Well, that's a pretty good question, so here are some rules of thumb-- although we are not terribly strict about adhering to them at all times! "Petite" stones are generally less than 1 1/4" (30mm) on the longest dimension. The small size also means the designs tend to be fairly simple-- there's just not that much "acreage" to work with. "Small" stones generally fall in the 1 1/4" (30mm) to about 1 7/8" (48mm) range, again using the longest dimension. The designs can be a little more complex. Most stones still fit within the realm of being good as "pocket stones." "Medium" sized stones run from about 2" (50mm) to just shy of 3" (77mm) on the longest dimension. This is the size we most often sell as "meditation stones" because they tend to be a size that fits nicely in the hand. On this size stone, some of the designs get quite complex. "Large" stones run from about 3" (77mm) up to about 4 1/2" to 5" (125mm) on the longest dimension, depending on the shape of the stone. These are "paperweight sized" for sure; some keep them as centerpieces on their personal altars or simply as pieces of art. 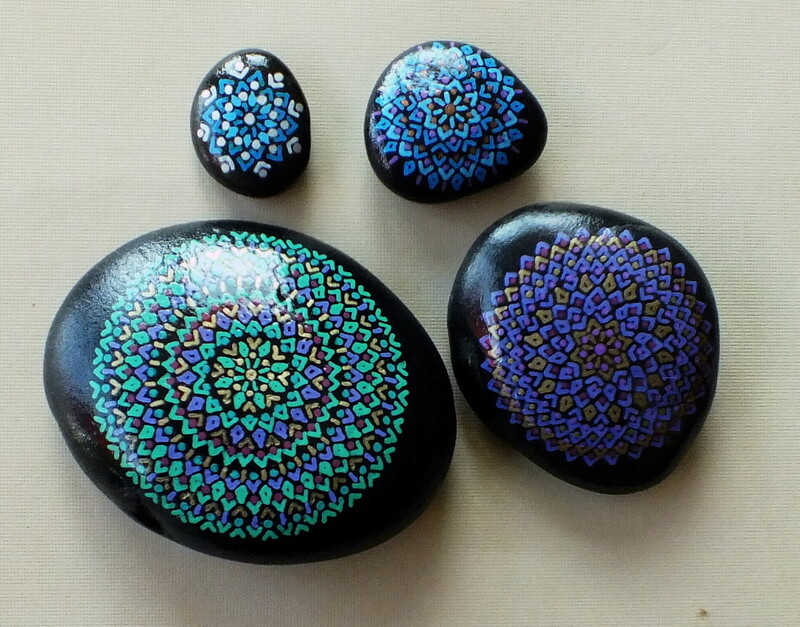 Large stones have the most intricate patterns and take a really long time to create. "Jumbo" stones are generally 5" (128mm) and larger, and I very seldom create them as "regular" Alchemy Stones because of the time involved and the rarity of completely smooth stones in big sizes. 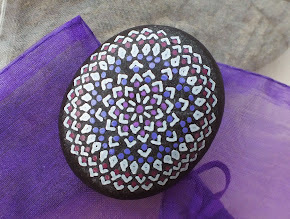 Accordingly, most really big stones I paint are "garden stones," which have far "coarser" designs and are designed to be kept outside. Naturally,the above are merely rough guidelines and not meant to be absolute rules.